t was spring and I was driving along the undulating single track road from Alwinton through spectacular Upper Coquetdale listening to Bruce Springsteen`s `The Promise`. The title of the album struck a personal chord for I was about to fulfill a promise I had made myself years previously when I regularly ran across these quiet northern hills. 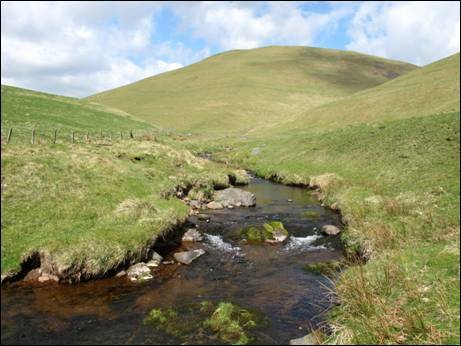 I was now bound for the border ridge from where I intended to explore the secluded and rarely-visited valley which carries the Rowhope Burn from its source high on Windy Gyle to the River Coquet just over 3½ miles away. I parked at Slymefoot where the Rowhope Burn quietly slips into the River Coquet and where, in the 18th century, there stood an inn which received its supplies of illicit spirits from stills hidden in nearby cleughs. It was, by all accounts, a den of iniquity. These days it is an idyllic and popular place to start a walk. The fresh morning air was clear and the sky was an almost perfect blue as I headed along the private road which serves the isolated farmsteads of Rowhope and Uswayford. Once past Rowhope I left the thin slither of tarmac behind and started the long climb towards the distant Windy Gyle. Of all the routes to the summit of this iconic hill the approach via the grass-carpeted top of Loft Hill is perhaps the least well-used. ausing briefly on the initially steep climb away from the valley I admired the seductive slopes of Shorthope Hill standing guard over Rowhope`s neat cluster of buildings. The downhill-tumbling dry stone wall, close to my left hand side, seemed totally at one with its more natural surroundings. In the distance, shapely Tindale Law climbed gently skywards. The scene was picture postcard perfect. The gradient eased as I continued uphill and soon I was stepping across the post and wire fence for a short detour to the unmarked and pathless top of Loft Hill. Like so many of the lesser tops in the Cheviot Hills, this 450 metre high hill is generally ignored as walkers head for the more popular and higher summits. It is this almost total lack of other people, along with the absolutely unique views, which helps to make such hills so tempting to the more independently-minded walker. I was perfectly happy to be alone. Back on track, I picked my way carefully through an expanse of ankle-twisting heather whilst, all the time, keeping my eyes well peeled for the occasional cleverly-concealed and potentially trouser-soaking peat pool. I reached the curiously named track, `Split the Deil`, unscathed and continued on towards the thin line of the border fence. The summit-topping triangulation pillar of Windy Gyle was now little more than a hop, step and jump away and, minutes after stepping on to Scottish soil, I was clambering up the huge Bronze Age burial cairn which adorns this superb hill. 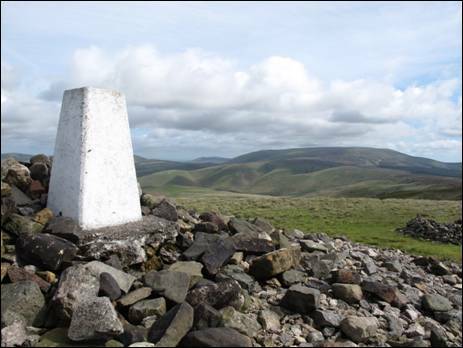 Standing 619 metres above sea level, Windy Gyle is the fourth highest of the Cheviot Hills and one of only six hills in the range which exceed the magical 2000 feet mark. 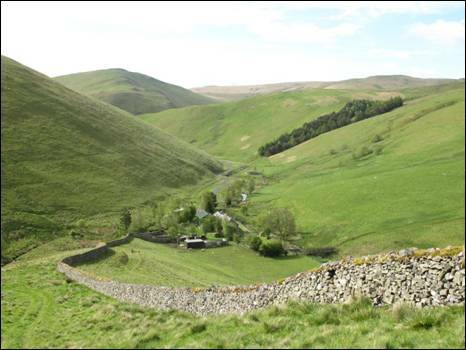 It lies on the route of the Pennine Way, England`s first long distance trail, and, along with the chart topping Cheviot, is the best known hill in the area. he border area positively oozes history. For centuries armies fought bloody battles, families stole cattle from one another and violence was an everyday way of life. The troubles rumbled on endlessly until the 13th century when, in an attempt to control the violence, the border area was split into three Marches. This created a buffer zone between England and Scotland and each March came under the stewardship of a Warden appointed by the King. These Wardens would meet on regular occasions, usually at isolated places along the border, and more often than not these meetings ended in bloodshed. 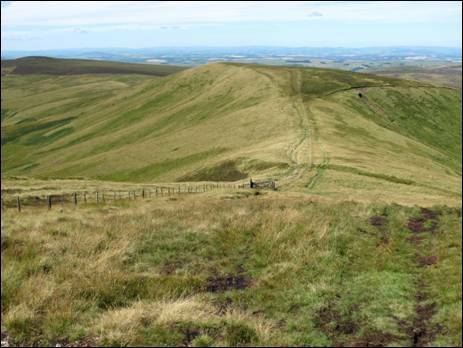 In 1585, at a meeting on Windy Gyle, one such Warden, Lord Francis Russell, was murdered and the large Bronze Age burial cairn was named `Russell`s Cairn` to commemorate the bloody event. The view from Windy Gyle exceeds expectations as it stretches out its tentacles in every conceivable direction. In his lovely little 1950-published booklet, `A Guide to the Cheviot Hills`, writer F. R. Banks enthused, “…..from Cheviot in the north west, by Comb Fell, Hedgehope and Dunmoor Hill, Shill Moor (east) and the flattish hump of Bloodybush Edge, Wether Cairn and the distant Simonside Hills, Shillhope Law (south) and yet more distant Pennines, and Thirlmoor (south west), to the Carter Fell range”. I spotted many more hills besides as I sat with my back against the concrete pillar munching my way through an ample supply of tuna fish sandwiches. I was utterly transfixed. But, as they say, time and tide wait for no man. I needed to be on the move again. I headed west along the line of the Pennine Way crossing back into England as I approached the green arc of Windy Rig and the head of the Rowhope Burn. Now it was time to head down towards the fledgling burn and the start of my journey through the deep and wayward valley. 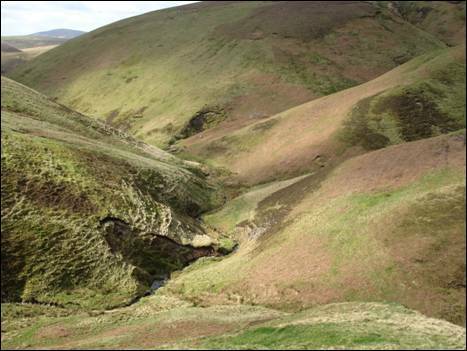 So, with the cleft of the aptly-named Foulstep Sike to my right, and the rough slopes of Windy Gyle to my left I descended on a bee-line course to what appeared to be a form of sheep enclosure some way below. As I headed downhill, I resisted the temptation to pick up my pace and go with the angle of the slope preferring instead a more sedate knee-friendly amble on the pleasantly cropped grass. Once past the enclosure, I aimed for the point where Foulstep Sike trickles into the Rowhope Burn, barely more than a few hundred metres ahead. At last, I was on the valley floor, in a world of my own cut off from the rest of mankind by steeply rising slopes and with each twist and turn of the meandering burn obscuring my way ahead. Thin threads of grass-sided cleughs tumbled towards the valley as I crossed and re-crossed the burn in pursuit of the best route through an avenue of near-vertical hillsides. This was the most perfect V-shaped valley you could wish to find with the only sign of man being the occasional tumbledown circular sheep stell and the faint indentation of an age-old sheep trace. The water in the burn was crystal clear and mirrored the blue sky above together with the odd renegade cloud drifting in from the west. ventually, beneath the grey slopes of Rough Knowe, the valley took on a wider and flatter form and revealed the most immaculate circular sheep stell I had seen for some time. There was barely a stone out of place and it seemed as if it had wandered out of a Chelsea Flower Show gold medal garden. The flanks of Black Braes climbed sharply away from the valley as I began to follow an intermittent and faint quad track through the boggy ground which stretched outwards from both sides of the broadening burn. I had now experienced the best that the valley had to offer and, with thoughts of tramping over higher ground, I was content to leave the burn behind. Suddenly, as if by chance, a convenient valley-exiting quad track appeared in front of me and guided me uphill relatively easily to the ancient cross-border track known as `The Street` which I was to follow for the remainder of my journey. Along the way, I made a short detour to the minor top of Swineside Law. Higher than Loft Hill by a mere 7 metres, the grass-carpeted summit made the ideal place to pause once again and to take one final look back at the wild border ridge. It had been a good day and, as I walked the last few miles back to the River Coquet, I vowed that I would return soon to explore yet another tiny corner of this the most tranquil place in England. That is official!